The deeper we seek, the more is our wonder excited, the more is the dazzlement for our gaze. 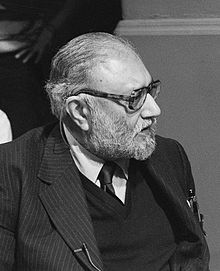 Prof. Dr. Abdus Salam (January 29 1926 – November 21 1996) was a Pakistani theoretical physicist who received the Nobel Prize in Physics in 1979 for his work in electroweak theory which is the mathematical and conceptual synthesis of the electromagnetic and weak interactions, the latest stage reached until now on the path towards a unification theory describing the fundamental forces of nature. By generalization of methods developed by Kamefuchi, O'Raifeartaigh, and Salam, conditions for renormalizability of general gauge theories of massive vector mesons are derived. ... It is shown that all theories based on simple Lie groups (with the one exception of the neutral vector meson theory in interaction with a conserved current) are unrenormalizable. (1 July 1962)"Renormalizability of Gauge Theories". Phys. Rev. 127. This in effect is, the faith of all physicists; the deeper we seek, the more is our wonder excited, the more is the dazzlement for our gaze. Speech at the Nobel Banquet (10 December 1979). The Holy Quran enjoins us to reflect on the verities of Allah’s created laws of nature; however, that our generation has been privileged to glimpse a part of His design is a bounty and a grace for which I render thanks with a humble heart. Address to UNESCO (1979), as published in Ideals and Realities: Selected Essays of Abdus Salam (1989), p. 251.